Back in August, Ertai’s Lament broke an exclusive that Ultra Pro was releasing a line of deck obxes in conjunction with Magic’s Archenemy, designed to hold two decks and the over-size Scheme cards that came with the set. Ultra Pro had a similar release for last year’s Planechase, and we were excited to have a better way to organise these decks. We’ve been big fans of what Ultra Pro has done with the Duel Decks containers in the past, and of their sleeves in general, so we had high hopes that these would be a great addition to the precon library. Unfortunately, they proved to be quite the disappointment. It seems that perhaps to cut down on production costs, rather than create a new box model to accomodate the needs of the decks, they instead used their standard size box and ‘make it work’ through jamming a removable folded plastic fitting from inside of it. 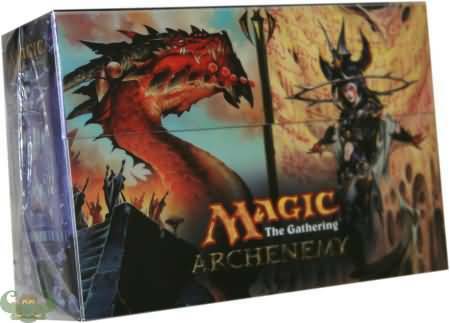 It’s hard to imagine that a company would issue a product that actually dissuades you from using their other products, but perhaps the most disappointing aspect of these boxes is that they will only fit the Archenemy decks if you don’t have them sleeved. If you’re as meticulous about the condition of your decks as we are and sleeve everything, you’ll have to be content with buying four of these boxes- two for the decks, and two for the Schemes. Unsurprisingly, any two top-loading Ultra Pro deck boxes will fit snugly inside the Archenemy box (as they do with the Duel Decks deck boxes). Through our dealings with Ultra Pro customer service, we’ve been won over and continue to be huge fans of their products. But unless you’re willing to plunk down for four of these boxes, or settle for storing your decks unsleeved, you may want to give them a miss. UPDATE: We also ordered some Planechase deck boxes, and upon their arrival found them to contain 60 regular sleeves and 10 larger, Plane-sized ones. This indicated a flaw in our understanding of the product- they’re not designed to hold two decks, merely one each. Thus, 60 sleeved cards will fit in a box, but you have to break them into two piles. Still, it would not have been fair to let our misconception stand. One deck box, one deck. We do love that Ultra Pro is trying, but there is room for improvement. The single biggest change we’d recommend? Lose that dreadful folded insert, and make them like they were designed to hold the cards. Thanks for the great product review. Definitely helpful! Didn’t look that solid to me when I saw the insides. I use one of the Duel Deck Boxes to carry my planes/schemes. Thanks for the review. Too bad about it. Would have loved a deck box a little thicker than the duel deck ones so I could put two boxed decks and the schemes in it.